One of the most potent forms of marketing for online courses is word-of-mouth referrals. It doesn’t matter how many adverts you pay for, guest posts you publish or webinars you run, your potential customers want to know what someone else thinks about your online course before they buy. A good marketer knows that once you’ve hooked a potential customer and they want your product, you need to remove all their excuses or reasons why they won’t buy. And often their very last objections can be cured with testimonials. Testimonials are your way of tapping into word-of-mouth marketing by providing a different voice to your own that can step in and whisk away a customer’s concerns just as their purchase anxiety starts to flare up. But how can you capture such testimonials when you’re just starting out? Well, let’s look at 5 quick testimonial capture hacks you can deploy to get rave reviews early and send sales through the roof! ​Most people are motivated by self-gain. Even if you ask for a testimonial, the chances that someone really wants to leave you one is slim. Sadly, ​customers ​only seem to contact you when something ​goes wrong, so ​take heart in the saying​ “​no news is good news” if you're not hearing ​much yet. ​But​ here’s a trick ​to help flip such selfishness on its head. If someone stands to gain something from leaving a testimonial, then suddenly their tongue is loosened (or rather their keyboard magically starts work​ing again). We saw Marie Forleo embrace this testimonial bait technique in the first launch of her now popular B School​ course, offering a ‘Bonus’ to her students if they filled out a 2-minute survey. She even made this a limited time bonus, to really motivate students to fill out the form! Fortunately, setting up your own testimonial bait is really easy with our testimonial management plugin, Thrive Ovation. Step 1: Begin by creating ​your Bonus. It might be a PDF, an extra video lesson, or some form of upgrade to your course content. What’s important is that students should feel like this is additional value, rather than something they’ve paid for that is being held for ransom. Step 2: Create two pages in WordPress, one for your testimonial capture form and one as a Thank You page with the bonus download. Make sure no other pages are linking to ​your thank you/download page. You want it to be an isolated page that cannot be accessed through any navigation links or organic search → see Step 3. Step 3: Make sure you are using the free Yoast SEO plugin. This is the most downloaded SEO plugin in the WordPress library, and we cannot recommend it enough. Under the Yoast settings for your bonus download page, click the cog and select ‘No’ under 'Allow search engines to show this page in search results' . This tells the Google bots not to show this webpage in any Google searches. Use Yoast to ensure Google doesn't show your bonus download page. Step 4: Create a page for your testimonial capture form. 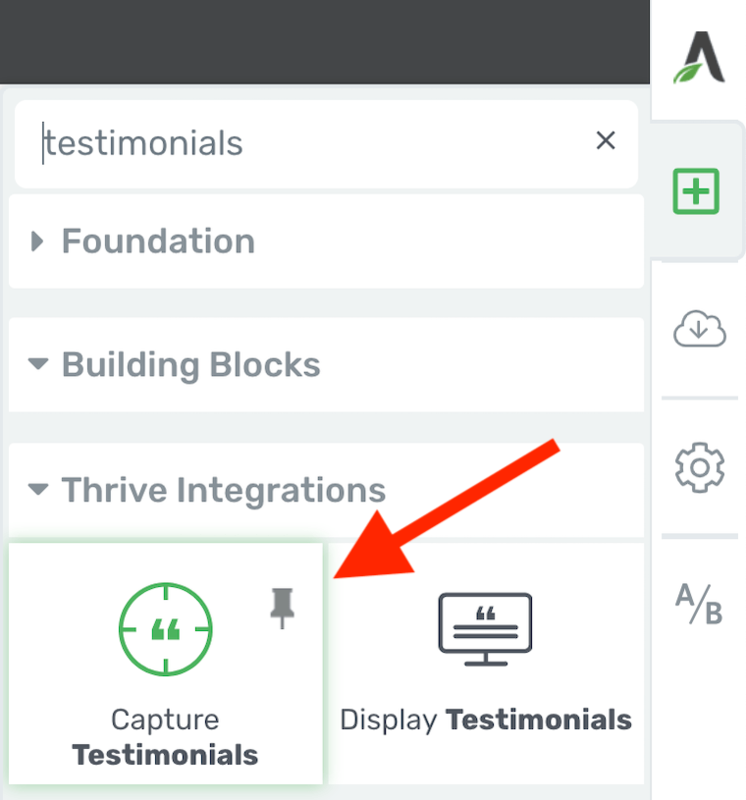 If you use Thrive Ovation and our visual editor Thrive Architect, you'll find a new 'Capture Testimonials' element that you can place anywhere on your page. If you're not using Thrive Architect, you can still add it to your page in the native WordPress editor using shortcodes. Step 5: Once you've added a capture form to your page, click 'Form Settings' in the sidebar and choose the ‘Redirect to URL’ option after a testimonial has been submitted. Now, once a student fills out a testimonial, they will then be sent to this page to download their bonus. 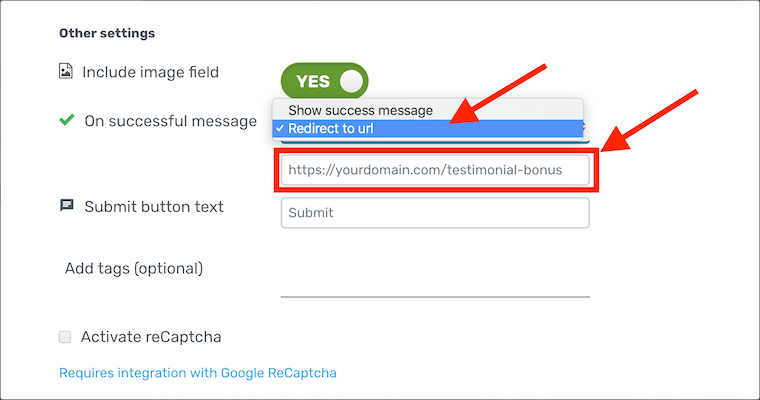 Thrive Ovation can ​send visitors to a URL to redirect upon Testimonial completion. Send students an email asking them to leave a testimonial, and link to the capture form directly from that email. Voila! After following those steps, your students will only be able to access the bonus after submitting a testimonial. The real value of a strong testimonial for potential customers is to hear the perspective of someone else who was once in their pre-purchase shoes. Although it’s nice to hear ​customers say that your course ​was ‘great’, it​'s not a very ​useful testimonial to help overcome purchase anxiety in potential customers​. Although this testimonial is nice (we definitely appreciate your kind words Joe! ), it doesn’t really tell a potential buyer if the product is right for them, does it? This is a lovely compliment, but doesn’t get into specifics. “My biggest struggle was trying to make my website look exactly how I wanted it to look both on desktop and on mobile. Thrive architect has changed everything for me. What used to take a week only takes a day or two now and the finished product looks better and loads faster. Do you see the difference? The second one is extremely specific, and takes the reader on a journey. So how do you encourage your customers to leave testimonials like this? You have to ask them specific questions. Customers are not marketers. They don’t know what your marketing hurdles are and what they could do to best help you, so they think a testimonial is merely stating that ​a product is great. But you need better than great for your marketing... you need specific. The way to do that is to prompt them with the right questions. And here’s some good news for you: we built Thrive Ovation with exactly that strategy in mind. Step 1: Outline a few questions that, when listed one after the other, tell a complete story of a student’s journey with your course. 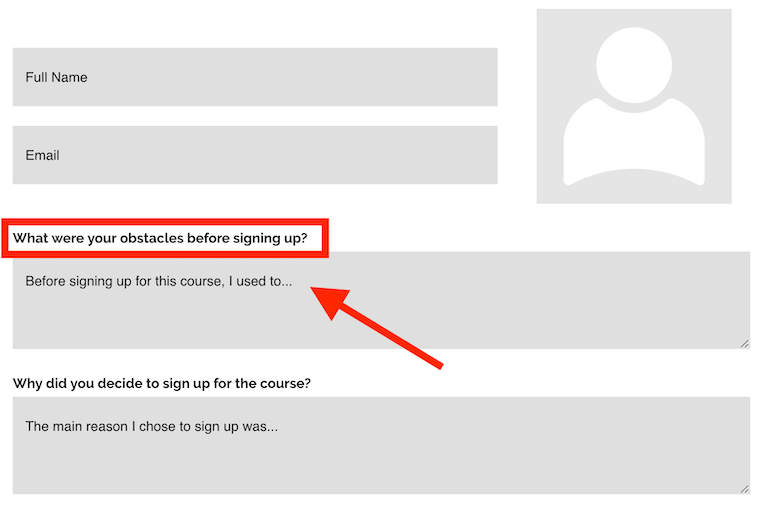 The arc of that story should start by asking what your customer’s problem was before taking your course, and end by asking how the course helped them to overcome that problem. Step 2: Place your list of questions on your Testimonial Capture page. If you’re using Thrive Ovation, then under the 'Form Settings' you can simply click the plus sign to add each new question to the testimonial capture form. You can add as many as you like! Step 3: Provide some placeholder text in the answer box to help students leave a testimonial quote that ​will make sense to future readers without ​having read the actual question. For example, ​you don’t want ​students to write ambiguous answers like “It was just what I needed." ​You want them to ​write something clear for any reader like “The Online Photography masterclass was just what I needed”. The result? Your capture form will prompt students to write answers to each question, creating a more complete testimonial. Don’t worry if they write too much, you can always trim it down. We have a free online video course at Thrive University all about how to Harness the Power of Testimonials. Sign up for the course now to learn additional strategies around how to make your testimonials even more compelling. I’m sure you’ve seen launch-discounts before​. It's when a product is heavily discounted from it’s ​normal price for a ​short period after it launches. In a product-launch funnel, launch discounts are a great marketing strategy to create buzz, collect your first set of customers, and gauge the market response to your offer. But providing a launch-discount is also an opportunity to ask for more in lieu of the full price. By positioning your course launch as a special beta program, you can ​easily ask students to fill out and return a product survey once they’ve completed the course. The trick here is to set their expectations up front when the customer is still considering the purchase. Agreeing to complete a survey in a few weeks time in exchange for a substantial discount seems like a great deal, and also justifies why you are offering your course at ​a lower price. Making this request explicitly clear to students opens the door for you to reach out at a later date and ​ask for sales boosting reviews, testimonials or feedback. Step 1: Set a normal price for your online course. Make sure you communicate ​what that ​full price is in all of your marketing content. Step 2: Slash that normal price in half for the first 72 hours that your course is live (or however long you want your launch-discount to run for), and make clear mention on your sales page that this is a beta-launch discount. Step 3: Use a Scarcity Countdown plugin like Thrive Ultimatum to shut down your discount offer once the timer reaches zero. 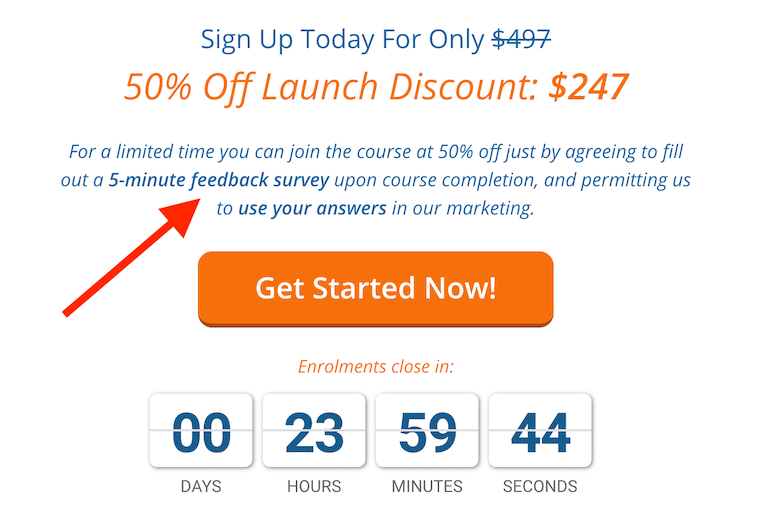 Step 4: Include this in your copy: “For the next 72 hours, you can join this program at the 50% off launch-discount simply by agreeing to fill out a feedback survey upon course completion and permitting us to use your answers in our marketing”. Step 5: Remind your students about this agreement again after they purchase. Once they have moved through your course, reach out to them and ask that they follow through on the request to fill out your Survey. ‘Survey’ is the secret word here. It’s both an opportunity to gain feedback and get testimonials if your customers have had an experience worth sharing. Often, your students aren’t actively looking to share their feedback with you, but rather with each other. This means they might take to Facebook or Twitter to share their thoughts. If you see such a social media comment that you’d like to harness, what can you do? Screenshotting is one way to present a testimonial from Social Media, but before long you may end up with loads of screenshots stuffed away in a ​folder on your hard drive. I guarantee you that’ll get tricky to file through and keep organized over time. But if you use our Testimonial management plugin, Thrive Ovation, then the solution to this problem is easy: you can import such testimonials ​onto your Word​Press website directly from Social Media platforms. The advantage here is that ​Thrive Ovation ​​records the name and ​image of the social media poster​ and ​automatically adds ​them to the testimonial ​you're capturing. You can then sprinkle that social proof across your website with ease. Step 1: When you find a comment on twitter or facebook, click either the date next to the comment or the drop-down arrow provided to open a menu with a few options in it. Choose ‘copy link’ from the menu. Step 2: In Thrive Ovation, choose ‘Import from Social Media’ and paste the link. Thrive Ovation will automatically pull in their profile picture, name, Social Media handle and their comment. You can make any edits right there in the​ import section. Step 3: If you are using Thrive Architect, simply drag and drop the 'Display Testimonials' element onto your page. If you're not using Architect, you can easily configure a WordPress display shortcode in Thrive Ovation that will work anywhere. 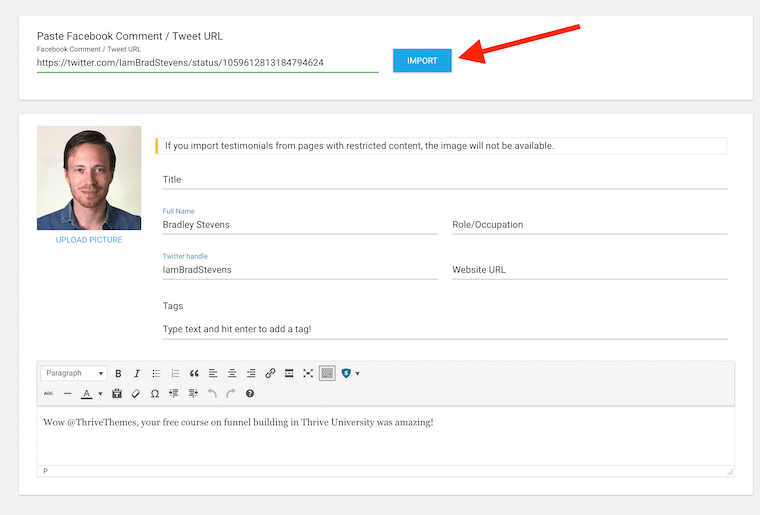 You can now select a single testimonial, a collection of testimonials, or dynamically display testimonials based on tags. Your new Social Media testimonial will be located at the top of your list. How easy is that? You’ve gone from spotting a Social Media testimonial to importing it, cataloguing it in your library, adding a picture, and displaying it beautifully on your website in under 3 minutes. Do You Need Permission To Copy From Social Media? The law is a little bit hazy on this one, but best practice is to always seek permission. Yes, the original commenter owns the copyright to their own tweet or facebook post. Fortunately, if they're willing to write a positive testimonial on social media where anyone can see it, they probably won't mind giving you permission to display it on your site. Reply to their comment thanking them for the kind words, and ask if they'd mind if you shared it on your site. Although written testimonials are super valuable, having a few video testimonials can really help potential customers pull ​that purchase trigger. From a visitor’s perspective, video testimonials are incredibly honest and an opportunity to hear someone who was in their position speaking openly about their experience with your product. But likely, your students won’t often go to the effort of setting up a camera, microphone and lighting to shoot a high-quality video just for you! So your job is to make the logistics of all that as easy as possible for them. And doing all that is as easy as… having a conversation. Requesting a Skype or Zoom ‘feedback call’ with successful students is pretty simple. Just ask them if they would be willing to chat with you about their experience after completing the course. And because online courses can sometimes feel a little impersonal, it’s actually a cool opportunity for students to speak directly with the course creator. Don't discount that...​ if they enjoyed your course, ​it will be valuable to them. Fortunately for you, services like Zoom and Skype now make it super simple to record those video chats. Now, ​let me be clear that you should ​never record a call without getting permission first. But if you follow the steps above to create bonus incentives or discounts for students in exchange for their video testimonial, you’re bound to have some eager volunteers. ​Note that ​your video testimonials don't need to be high production quality ​endeavors. A video recorded from a built in laptop camera + microphone ​is perfectly acceptable to display as a testimonial on your website. Step 1: Contact students that have completed your online course, or who are part way through and enjoying the program. Offer a free bonus coaching call and feedback session with them in exchange for a video testimonial. Step 2: Set their expectations ahead of time. Ask them if, at the end of the coaching call or feedback session​, you can record them answering a few simple questions about their experience with your course? ​Again, ​​​​never record anyone without permission. Step 3: The latest versions of both Zoom and Skype now have call recording features built into them. By pressing record, it will notify both people on the call and record the audio and video of your chat. Step 4: Prepare and ask questions that illustrate the entire journey the student moved through, from their problems before the course, to why they signed up, and what they have learned since completing it. Step 5: Edit the recording to remove your questions. Your video testimonial is now ready ​to upload on your website! By doing this, you’ve managed to provide extra value to your students through a 1-on-1 call, whilst also collecting extremely valuable video testimonials. Testimonials are a massive conversion-boosting necessity for Online Course creators. And because the best time to trade discounts for feedback is during your initial course launch, make sure you prioritize getting such testimonials early. It may be ​the deciding factor in the ultimate success of your product. Once you have a library of valuable testimonials, you can then use them in multiple ​locations across your website. Place them on your sales page, ‘about’ page, homepage, and even include them in your email marketing and social media campaigns. If you haven’t created a testimonial management strategy for your online business yet, you need one ASAP. Fortunately, that’s exactly why we built Thrive Ovation to help you. Are there any other great hacks for collecting testimonials you think we missed? Leave a comment below and tell us the slickest way you’ve seen someone ask for a testimonial! ​P.S. ​Thrive finally has an Instagram @ThriveThemes​! did you already built in the possibility for users to upload their own image from desktop? It’s great to see you can now import social media testimonials into Thrive Ovation! Thanks Brad for this post. Would love to have the possibility of embedding videos in Thrive Ovation. Home run. Great content. Thanks Brad. Great point about asking specific questions to create great testimonials. Too often I see generic testimonials that do not really tell you anything about the benefits. Specific testimonials helps customers envision how your course can help them reach their goals. Can I buy you dinner!?!?!?! I implemented this and also sent the survey email to all of my existing customers yesterday…and the response rate was THROUGH THE ROOF! Now I need to take a few hours to sort through all of the survey results – and that, my friend, is a great problem to have. Ovation makes it so easy. I do wish I could view results in a new tab. When I try that, it takes me to a screen with the same list. A pop-up view on the list page would also be helpful to eliminate the people who left one-word replies, that sort of thing. Anyway, thanks again for this! I found the option to view the complete testimonial in the lists so that sped up the review process! Hah! If you swing past Australia, let me know! This is great to hear, Chris. We write these blog articles to try and help people improve their businesses, but hearing that you immediately implemented it and saw results? That’s the best outcome we could hope for! Thank you, Brad. Nice advice. I need some of those to be used on my Teachable courses. Hey Luis, I’m curious about your set up. So you have a wordpress site for marketing purposes, with a wordpress Sales Page, and then the course hosted on Teachable, is that right? How is that working for you? We’re using Teachable too, even though Thrive Themes is *awesome*, the key was not having to do support for the course infrastructure and focusing on delivery of the course; sometimes entrepreneurs in small biz have to delegate. Also, the built in affiliate referral program in Teachable was key, b/c it allowed us to nix Clickbank (or similar) from our infra plan. By the way Bradley, this article is one of the most valuable and useful we’ve read (reading this several times); all Thrive articles and univ and knowledge base are impeccable, but this article we found particularly timely and useful. THANKS! You’re welcome, Lisa. I’m just happy to hear that our articles are helpful. Teachable + Thrive Themes seems to be a common setup that we’re seeing. May I ask: with your set up, are you using Teachable for your Sales Page, or are you using Thrive Architect that links to a teachable ‘buy now’ button? We’re doing both, Thrive for the long form sales landing page that links to Teachable, and there will be a Teachable sales page for those who are already on teachable. So the funnel would start with the opt-in/lead magnet to auto responder (we use Drip.com) with Thrive Quizzes to warm up the leads, then to webinar, then to Thrive Architect sales page, to the course on Teachable. Is it possible to combine this with rich snippets in Google? Not quite. Testimonials are a bit different to reviews. If you want a Star rating to appear in Google, you need to use a Rich Snippets plugin and set it at the page level. We’ve written about a recommended plugin for that right here. Hope that helps, Albert! This is interesting idea, Alex. I’ll bring it to the team and see. #1 – we received a lot of spontaneous feedback by email. Having a way to import them in TO by just forwarding the email to a specific address would save a lot of time. I don’t have the Import From Facebook/Twitter link in Ovation. How do I turn that on? It should be there, no need to turn it on. To find it, Open Thrive Ovation from your WordPress menu. At the top you’ll find a ‘capture testimonials’ drop down option. Click it and the fourth option should be ‘Import from Social Media’. If it’s still not there, head over to Support and they’ll find a solution. Having built the testimonial capture page – and having designed a series of questions to provide excellent testimonials – and providing example answers… How can we (upon completion) access this data easily? Is it exportable? 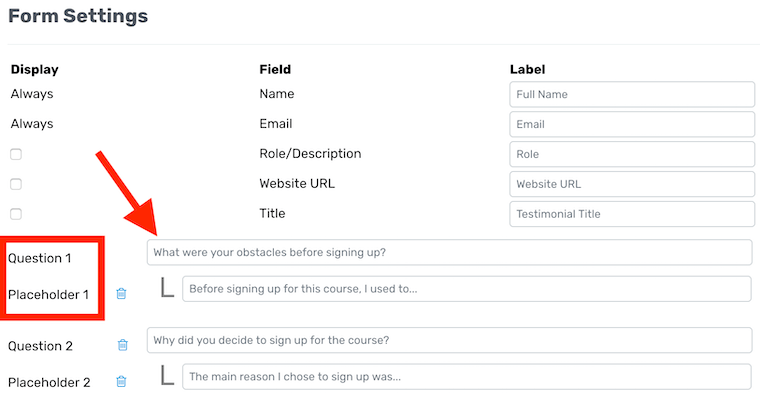 Use Case: How might an instructor with 200 students leverage the collected info once entered into Thrive Ovation via said page, without having to copy/paste into CRM, spreadsheet, etc? Can these testimonials be printed or exported to PDF? Once you’ve gathered testimonials, you’ll find them all listed inside your Ovation dashboard, and you can filter them by tag. The best thing I can recommend is to start tagging testimonials as soon as they come in. Tags aren’t seen on the front end but will help you manage short-lists for your to review, find and display them. You can also filter by untagged to see which ones might need a tag. As for exporting, you raise a good point. There is no way to currently auto-export them in a list. This is the first time I’ve seen this request, but it’s a good one I agree with. I’ll take it to the team as a feature suggestion. Thanks! Once more people start integrating what you taught in this article, someone in their sales org will ask them how they can leverage all that data to close sales and deliver customers what they’re asking for in the surveys. That’s a very convincing argument, and I’ve taken it to the team. Perhaps we’ll be asking for that testimonial from you sometime. Is there any way to link the testimonial form with an auto responder sequence? I want them to get a bonus video ‘plus’ be added to a special mailing list (through Mailchimp). Not yet, but that’s a good idea. I’ve been thinking of the application of something like this. Some emailing marketing services allow you to track page visits. I’m not sure if Mailchimp can, but if it does, you could trigger an automation once a visitor arrives at the Testimonial Thank You page. Thanks for a great post, Bradley. I’ve used Thrive for the last 2 years, but I haven’t tapped into Ovation or Testimonial features. You laid out how easy to use these tools are, and now I’m getting started using them! You’re welcome, Matt. Ovation is especially good when you create a set-and-forget testimonial collection system. Hope you like it!